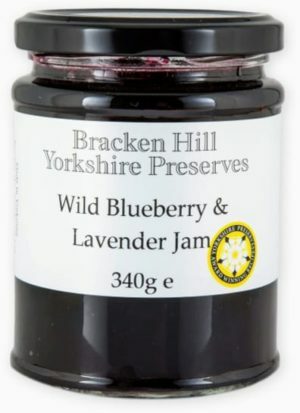 Made with Lavender grown on the Yorkshire wolds and wild blueberries from North America. This Lavender jam is something special. Delicious served on a scone, baked in a cakes or just add a spoonful to ice cream for an easy treat. Imagine what you think paradise is……then try this jam and you will realise your imagination! The most delicious jam, bought at Harrogate Spring Flower Show, thank you for having an on line shop, so I don’t have to wait till Autumn show for next lot! Bought on a trip to York . Best jam ever. I bought a few jars at the Harrogate Spring Flower Show. They are so lovely and now I am very happy because I know where I can buy more. This is possibly the most delicious jam I’ve ever tasted! Sugar, Blueberries 36%, Lemon Juice (From Concentrate), Lavender 6%, Gelling Agent: Fruit Pectin, Citric Acid, (Prepared with 45g Fruit per 100g. Total sugar content 67g per 100g).